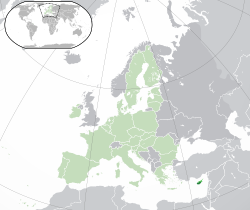 The total area of Cyprus is 9,251 km2 (3,572 sq mi). Cyprus has a typical Mediterranean climate, with hot, dry summers and a cool, rainy season that extends from October to March. It is a large island, the 3rd biggest in the Mediterranean after Sicily and Sardinia (both islands of Italy). The highest mountain in Cyprus is Mount Olympus at 1,952 metres. Cyprus gets a lot of tourism. Tourism is mostly centered around Cyprus' clean beaches. 10% of Cyprus's income comes from tourism and it is the 40th most popular tourist destination in the world. Just under 50% of tourists come from the United Kingdom. Recently Cyprus has provided activities to motivate people into coming for winter and all year round tourism such as in the form of nature, golf and activity holidays. Marinas and casinos are being considered to add to the tourist attractions of the island. There are 3 UNESCO World Heritage Sites on the island of Cyprus. This page was last edited on 4 November 2015, at 15:34.